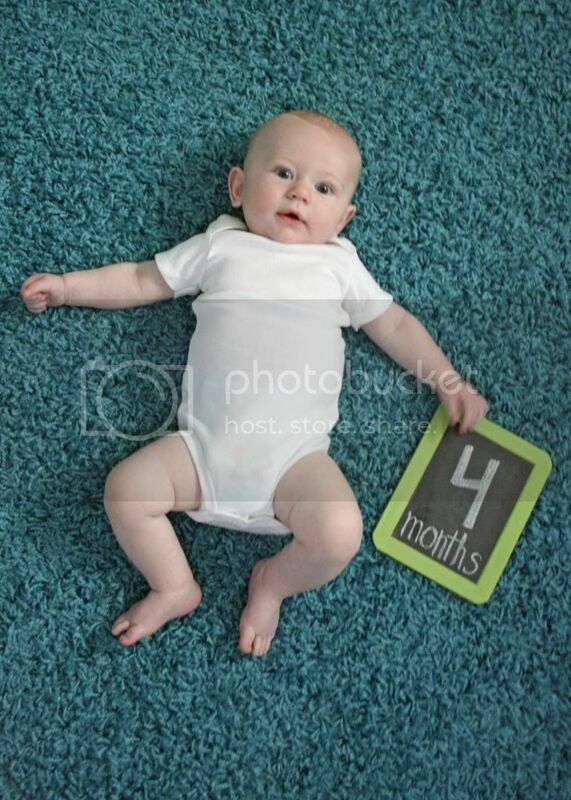 Jordy Liz Blogs: Dear Liam, You are four months old. Dear Liam, You are four months old. You are four months old - a third of the way through your first year. This last month can be summed up in one word: active. By three and a half months, you were rolling over from your back to stomach. As soon as you learned that trick, you figured out how to make a b-line to the edge of whatever you were on - blanket, bed, rug - and scoot, scoot, scoot. Long gone are the days I can take a peaceful shower while you hang out on our bed in between pillows. You've also learned how to do this in your crib in the middle of the night which makes for a lot of trips into your room to scoot you back to the middle. You never stop moving! We pulled out the exersaucer and you took to it immediately. You love to stand, so we knew it'd be a hit. Your legs are so strong; also long gone are the days where I let you stand on my stomach. I am pretty sure you can cause some serious internal damage. You've learned how to grab anything in sight - my face, my hair, my phone, your pacifier, the dog. I love the look on your face after you get your hands on something; you feel so accomplished and excited. What I have loved most about this month is just watching you become a little boy. You're easy to please as long as you're fed and diapered. And, oh, how your face lights up when you see mine; I love getting that reaction out of you. I love being the one you cry for and the one you stop crying for. I know that will eventually change, but I am soaking it up for now. These last few months have taught me that it only gets better. That's what I have loved about being your mother; each day you learn something new and I get to be the witness of it. You just get bigger, stronger, and smarter each day. We're having fun with you, little man. holy little chris!! wow!!! he changed alot in his face this past month! He's so cute and I love these updates. It's crazy how he changes every day! I see some expressions that remind me of myself, and then others that are so Chris. Definitely a mix of the two of us! Thanks! I am hoping it will be good to look back on and see how he grew.